Do you get overwhelmed at the beginning of a project? Do you struggle to boost team productivity? The secret to alleviating common project challenges is to set specific goals. S.M.A.R.T. goals are designed to provide structure and guidance throughout a project, and better identify what you want to accomplish. This method is especially effective in helping employees set goals that align with company. ​S.M.A.R.T. goals are a relatively new idea. In 1981, George T. Doran, a consultant and former director of corporate planning for Washington Water Power Company, published a paper called, “There’s a S.M.A.R.T. Way to Write Management’s Goals and Objectives.” In the document, he introduces S.M.A.R.T. goals as a tool to create criteria to help improve the chances of succeeding in accomplishing a goal. Who – Consider who needs to be involved to achieve the goal (this is especially important when you’re working on a group project). What – Think about exactly what you are trying to accomplish and don’t be afraid to get very detailed. When – You’ll get more specific about this question under the “time-bound” section of defining S.M.A.R.T. goals, but you should at least set a time frame. Where – This question may not always apply, especially if you’re setting personal goals, but if there’s a location or relevant event, identify it here. Which – Determine any related obstacles or requirements. This question can be beneficial in deciding if your goal is realistic. For example, if the goal is to open a baking business, but you’ve never baked anything before, that might be an issue. As a result, you may refine the specifics of the goal to be “Learn how to bake in order to open a baking business." Why – What is the reason for the goal? When it comes to using this method for employees, the answer will likely be along the lines of company advancement or career development. 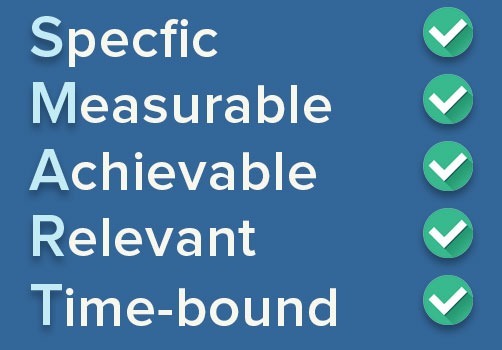 What metrics are you going to use to determine if you meet the goal? This makes a goal more tangible because it provides a way to measure progress. If it’s a project that’s going to take a few months to complete, then set some milestones by considering specific tasks to accomplish. This focuses on how important a goal is to you and what you can do to make it attainable and may require developing new skills and changing attitudes. The goal is meant to inspire motivation, not discouragement. Think about how to accomplish the goal and if you have the tools/skills needed. If you don’t currently possess those tools/skills, consider what it would take to attain them. Relevance refers focusing on something that makes sense with the broader business goals. For example, if the goal is to launch a new product, it should be something that’s in alignment with the overall business objectives. Your team may be able to launch a new consumer product, but if your company is a B2B that is not expanding into the consumer market, then the goal wouldn’t be relevant. Anyone can set goals, but if it lacks realistic timing, chances are you’re not going to succeed. Providing a target date for deliverables is imperative. Ask specific questions about the goal deadline and what can be accomplished within that time period. If the goal will take three months to complete, it’s useful to define what should be achieved half-way through the process. Providing time constraints also creates a sense of urgency. ​When it comes to writing S.M.A.R.T. goals, be prepared to ask yourself and other team members a lot of questions. The answers will help fine-tune your strategy, ensuring the goals are something that’s actually attainable. While you should be as realistic as possible, it’s important to approach writing S.M.A.R.T. goals with a positive attitude. After all, this is something that you want to achieve. This doesn’t have to be a daunting experience; in fact, it should be quite illuminating. Below we demonstrate how to write S.M.A.R.T. goals for two typical business scenarios: completing a project and improving personal performance.